When it comes to CO2 regulators, we’ve tried them all. This quality unit by Taprite is our favorite on the market. It’s no wonder this regulator is trusted by so many breweries and beer bars—it represents the best quality at a great price. Available in a standard, single-body model, as well as a dual-body model which allows you to send different pressures to two separate kegs from the same CO2 tank! This is the T742HP model, where the HP stands for high performance; it won't freeze up when multiple taps are running at once. It appeared to be the best one to choose. Top rated on many sites. Taprite regulators are the best in my opinion. use one, want another. I already have one and haven't had any problems with it. To control carbonation of beer. My buddy never gave mine back. I'm building my first keezer. What size gas line can I attach to it? BEST ANSWER: You can replace the barb on the end to whatever your system is sized to. But I think it is set up for 5/16 ID, the draft line standard CO2 line size. 5/16" is standard but you can change the barbed fitting for other sizes. 5/16 inch ID tubing fits perfect. Do you sell replacement o rings? It looks like there was one in my regulator where it attaches to the CO2 tank but has fallen out. It's only brass metal in there now. BEST ANSWER: Hi Ben - Attached are our replacement regulator gaskets. Excellent reg but should have the option to buy a type 30 lock but fir EU/AUS bottles. I needed a regulator for pushing the beer out of my conical fermenter, which needed to be below 5 PSI. 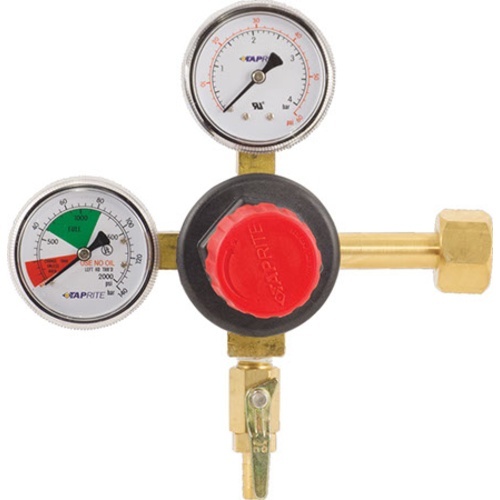 This regulator works well in that range, making it easy to control. The gages are easy to read, and the control valve is very fine adjusting, with the feature of push-in (it clicks in) to disengage so it isn't changed accidentally. I may get one of these in the dual configuration for my kegging system some day, as it is much improved over those I've been using. Great regulator. I have purchased 6 of these for a few kegerators. Solidly built. Easy to set pressure and lockable if you wish. Get the guard to protect gauges and this will last a long time and will be dependable. A solid and dependable regulator. I've used it for 5 months without a problem. Holds pressure perfectly and is easy to use. Excellent quality. Seems to be very accurate and easy to set and read like the locking feature of the adjustment knob. Would definitely recommend. My 25 year old regulator developed a leak too big for me to fix. You know, that really old thing that it took a screwdriver to adjust? I checked all the reviews and figured that this was not a place to cheap out. The new Tapright is the best. This thing adjusts so much easier than old faithful. MoreBeer calls it "high performance" for a reason. I wish I would have bought this years ago. (BTW, even "old faithful" I bought from MoreBeer, all those years ago). A company that gets all my beer business. Great product. Superior quality. Does exactly what it’s supposed to. Works perfectly for my four keg setup. Well built, easy to dial in, and very accurate. Glad I bought this. My 30 year old Taprite regulator was in need of replacement. It had performed so well over the years that there was no question that the new regulator would also be a Taprite. The T742HP holds pressure steady as a rock. Looking forward to this one lasting 30 years too. Works as expected. Easy to install and adjust. 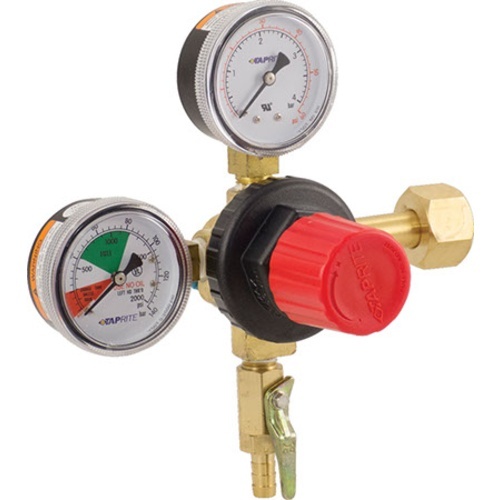 The regulator sets and maintains CO2 pressure. But setting it is strange. Instead of the single-turn setting of the mini-regulators, this one takes many turns to increase or decrease pressure, like the screw-type, with a knob stuck on. Much better than the one I had. I have been using the Taprite CO2 Regulator for two years without any problems. Just purchased a second one for keg purging and pressure transfer from fermenter to keg. After using Taprite's dual gauge CO2 regulator for over a year, I can say the quality is top notch and well worth the money. Highly recommend. I originally purchased the cheapo and fairly quickly one of the gauges starting spinning backwards. Morebeer replaced it with this and it's been working fine for several years. Have other regulars and Taprite is the way to go! Have has this one for over a year and is the one I use in my keezer. Many other regulators out on the market are not designed specifically for beer usage. Taprite makes a great product. The gauges are easy to read, they are accurate and best of all, is the adjustment knob. Many others have an inferior screw or bolt design that require a screwdriver or wrench. A major inconvenience when tweaking carbonation levels and bumping back down for dispensing. Take my word - not something you and to have to use a tool for! If you are new to begging - do not skimp on this critical piece of equipment. This is my go to GAUGE! I have had many co2 regulators over the years. This one is easy to adjust and doesn't seem to creep up. Been using it for a year now with zero issues. Awesome product. I really love this regulator. My only wish is that it had better control around 2-4 psi. Hitting that mark takes a little patience.Other than that they work really well. My regulator arrived with a broken shutoff / check valve. Morebeer quickly sent a new valve. It works perfectly (but it is a little noisy). Had this dual gauge regulator already, but it broke because a friend was messing around with it trying to get a better pour. Wasted no time and purchased a replacement, works great! Nice to have 2 gauges and know how much you have left. This regulator is solid and I really like the knob provided for adjusting keg-side pressure. It's so much easier to dial-in the pressure I need without fumbling with a screwdriver as required by my older regulator. I've had other Regulators before that cost more that did not perform as well as this one. Love the fact that you don't need a screwdriver to adjust the pressure! Seems like a pretty decent regulator. Only downside for a "premium" regulator is that it has no manual pressure release valve. I didn't realize this until after I got it. Decided to keep it anyway. Hoping I don't regret this decision, since I use the release valve frequently, especially when resetting from very high pressures (force carbonating) to low pressures. I got this regulator and hooked it up for the first time. Pulled the handle and tried to adjust it, and the handle just spun. Pulled the thing apart and saw that the handle is just plastic on metal and it wasn't seated properly from the factory and stripped. Tried to contact Taprite and just crickets... Huge waste of money. Boy oh boy... I love it when I can pat myself on the back for not making a bad buying decision. This reg is awesome. I have to laugh when I see friend's who have to but out tools to adjust their regs. This thing holds pressure perfectly and have never had any issues with it. You'll be happy!! I've been using this regulator for almost a year and haven't had any problems with it. There's not a lot to review here. It's a high-quality dual gauge CO2 regulator. I love having the dual gauges so you know how much is left in your tank and what pressure your dispensing. Worth the money. Well I've used this regulator over a year now and its been abused a little more than I care to admit. It's still working like a champ flawlessly. This is my 3rd regulator and the 1st one that worked straight out of the box without needing to be tightened. I have other brands of regulators. This one is easy to adjust and holds the pressure rock steady. No drifting. It is worth the money! My last regulator broke when my CO2 tank fell over, I hadn't considered buying a new one before that but am glad I did. This is built solid and easy to control. The best feature is probably the flow control knob that can be turned by hand rather than with a screw driver, this may seem like a minor convenience but comes in handy often. I will not buy another kind. Does not creep as much as others, and is very solid. Es un producto de calidad superior, de exelente funcionamiento, altamente recomendable. Works great. My first regulator was a cheap piece of junk. When I first picked this one up, I immediately thought the quality was better. I'm having a much easier time dialing in the pressure I want. I have a few dual gauges, and this is by far my favorite. No screw driver needed. Very easy to manipulate pressure output. And no leaks at the connection points.